We've been awash in British royal wedding bliss over the past few days, but today, we're hopping in our time machine and turning the clock back fourteen years, to survey the jewels worn at the gala held the night before King Felipe and Queen Letizia of Spain's royal wedding. Here's the first part of our royal jewel flashback -- stop back later today for part two! 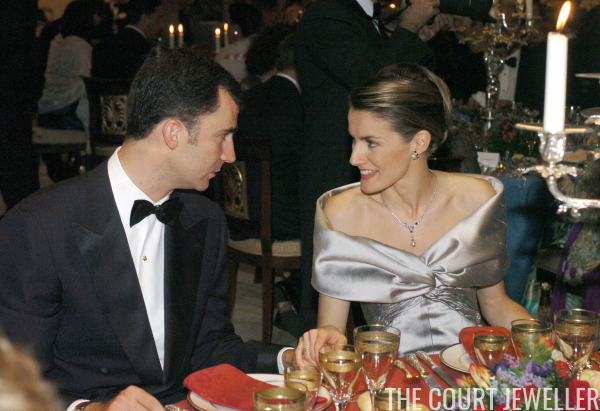 For the gala dinner at the Royal Palace of El Pardo, Letizia wore a suite of diamond, sapphire, and pearl jewelry that once belonged to Felipe's grandmother, the late Countess of Barcelona. She paired the jewels with a silver gown. On her right wrist, she also added a simple bracelet. The groom's mother, Queen Sofia of Spain (pictured here with her cousin, the Prince of Wales), wore pieces from the Niarchos Ruby suite. 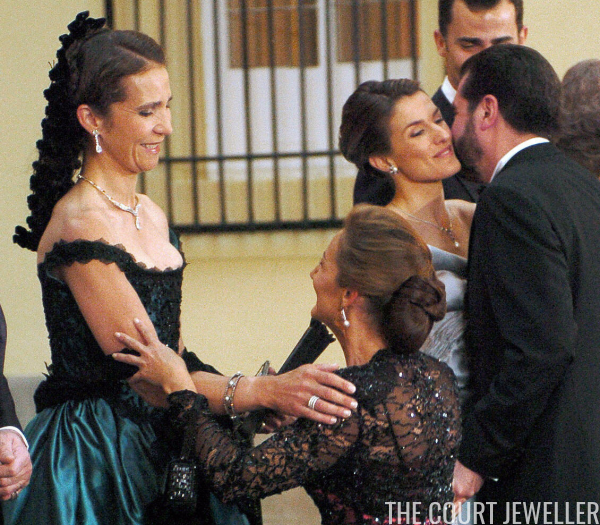 Infanta Elena, the groom's sister, wore diamond jewels for the dinner, plus a bracelet that appears to also be studded with pearls. And his second sister, Infanta Cristina, wore an intriguing necklace that appears to be made of a diamond and emerald brooch attached to a teal ribbon. Here's another view of the converted brooch. 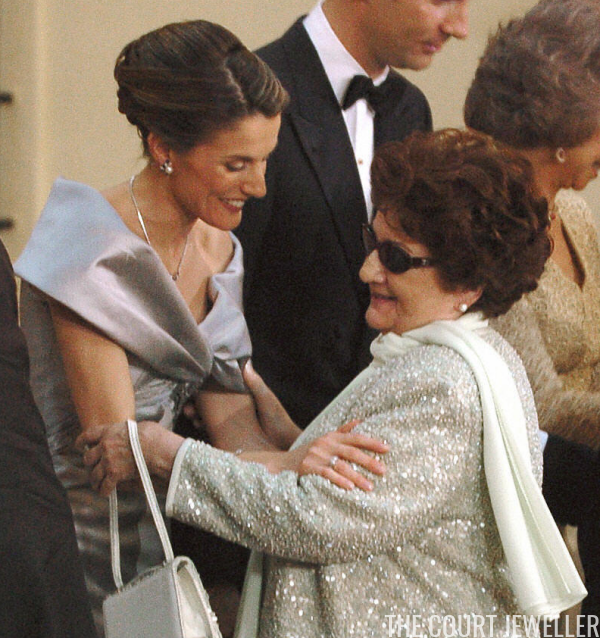 Letizia's mother, Paloma, was elegant in earrings with pearl drops for the gala. Her grandmother, Enriqueta, also chose pearl earrings for the occasion. 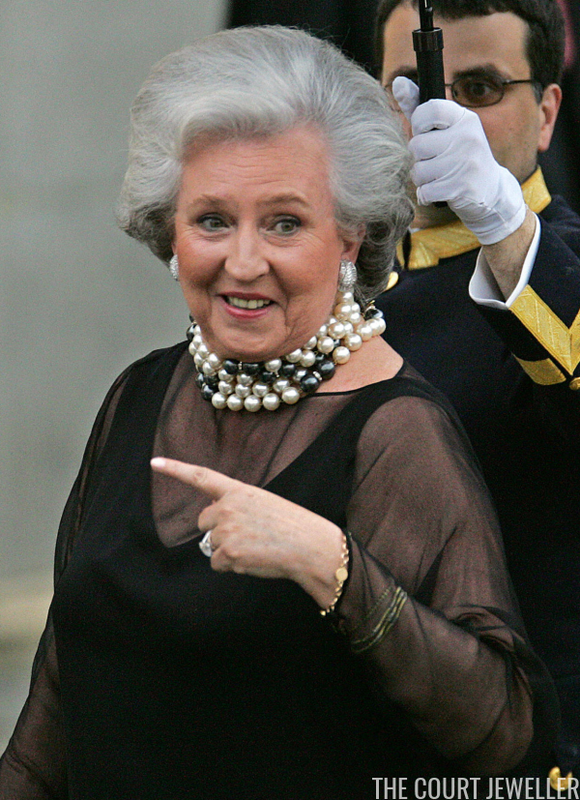 As did Felipe's aunt, Infanta Pilar, who really piled on the multi-colored pearls for the gala, pairing them with diamond earrings. Numerous other members of the groom's extended family were in attendance. For example, here's a look at Pedro of Bourbon-Two Sicilies and his wife, Sofia Landaluce y Melgarejo, who wears a pearl necklace ornamented with a diamond star. Pedro is the son of Infante Carlos, a nephew of the Countess of Barcelona. 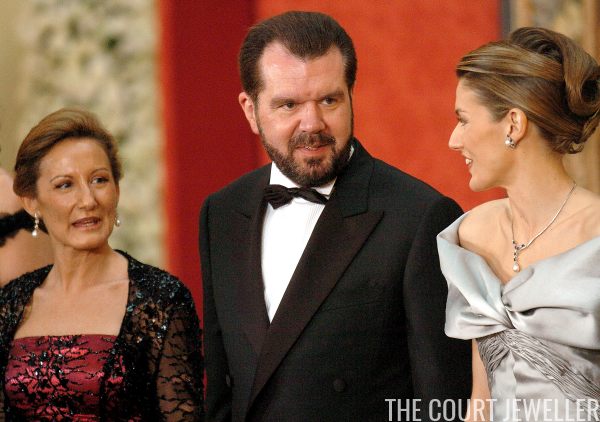 At this gala, Sofia was expecting their third son, Pedro. Felipe's maternal family was also well represented. 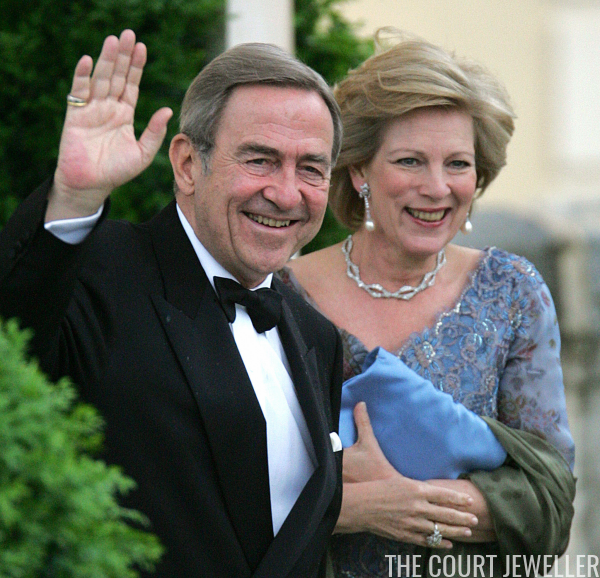 King Constantine and Queen Anne-Marie of Greece, his mother's brother and sister-in-law, attended the reception. Anne-Marie wore lovely pearl drop earrings with her diamond clips and the diamond necklace that came from the collection of her grandmother, Queen Alexandrine of Denmark. Among her bracelets and watches you'll also spot the golden bracelet worn by all female descendants of Princess Margaret of Connaught. 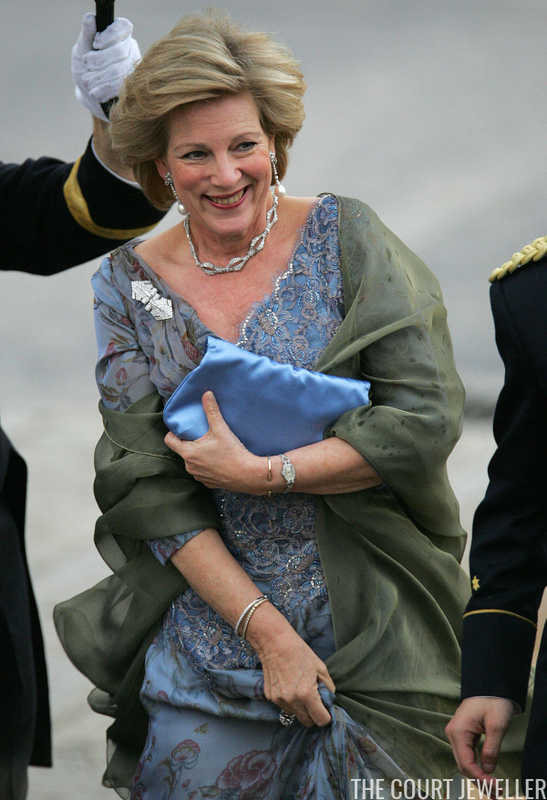 Marie-Chantal, wife of Felipe's cousin, Crown Prince Pavlos of Greece, also attended, wearing gem-set earrings and a single-stranded necklace of large pearls. She was expected the couple's fourth child, Prince Odysseus-Kimon. 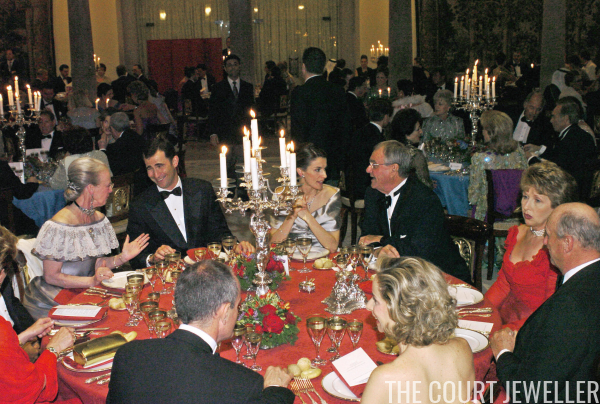 Anne-Marie's eldest sister, Queen Margrethe II of Denmark, also attended the gala, which was held only a week after the wedding of her own son, Crown Prince Frederik. 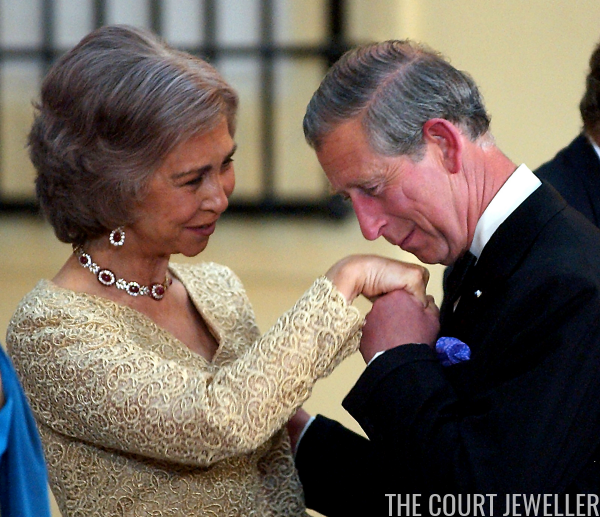 She wore a trio of diamond pieces, including Queen Louise's Diamond Bracelet (worn as a choker necklace) and Hereditary Princess Caroline's Diamond Earrings. 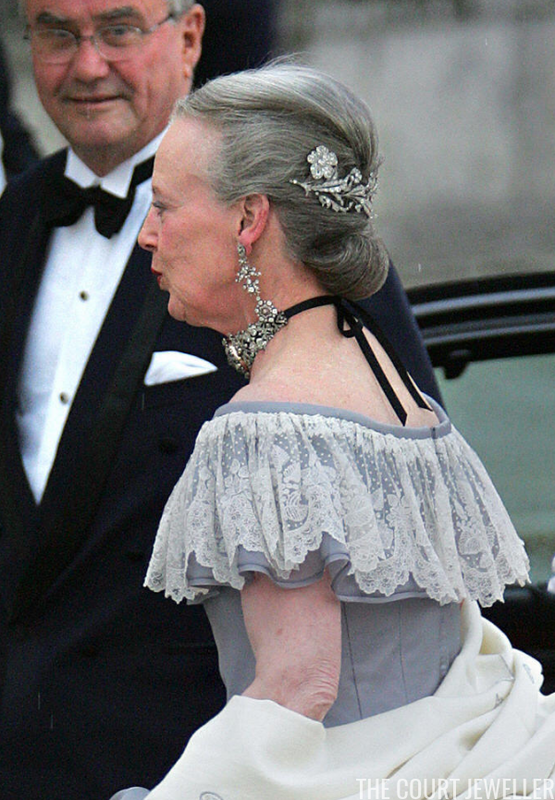 She also managed to sneak a tiara in to this non-tiara event, wearing part of the Danish Floral Aigrette in her hair. Queen Silvia of Sweden also dipped into the family vaults for this gala, wearing the Karl Johan Earrings with one of the family's diamond rivieres. On her left wrist, you'll also recognize the diamond bracelet worn by Princess Madeleine on her wedding day. 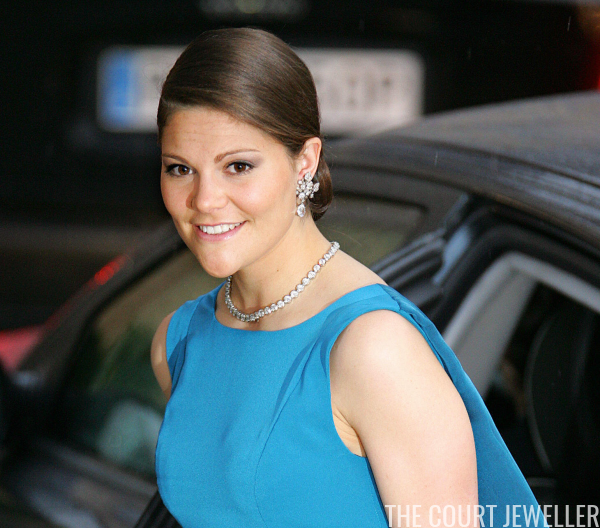 Crown Princess Victoria of Sweden also wore diamonds, including a riviere and the diamond floral earrings from the Brazilian parure. Heirloom jewels also accompanied Princess Madeleine of Sweden to the reception: the diamond earrings taken from Queen Josefina's Stomacher and the drops from the Connaught Diamond Tiara worn as pendants on a necklace. 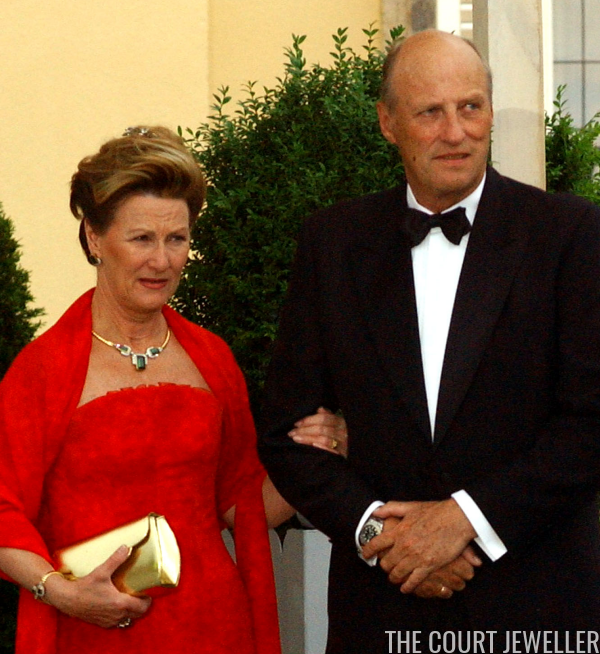 Queen Sonja of Norway went more modern with her jewelry, wearing pieces from her Modern Gold Parure. Crown Princess Mette-Marit of Norway wore a lovely pair of diamond earrings with family provenance: they were given to her husband's grandmother, Crown Princess Martha, by his grandfather, King Olav, as a silver wedding anniversary present. Mette-Marit received them from the present king and queen as a wedding gift. 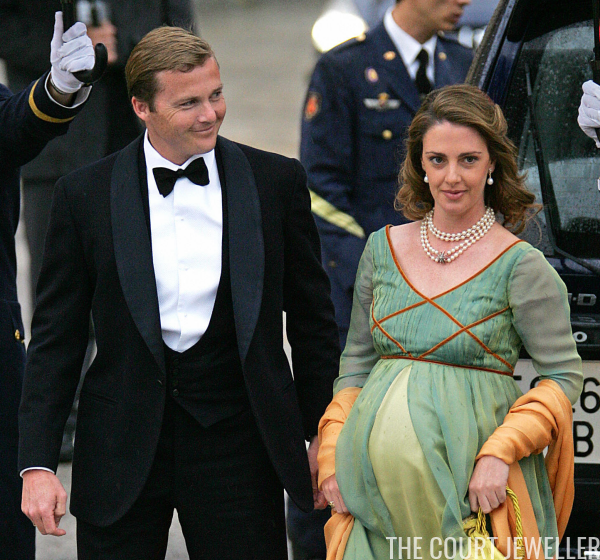 Colorful jewels were Princess Martha Louise of Norway's choice for the gala. She wore gem-set earrings and a coordinating necklace, featuring a spherical pendant set with multi-colored stones. She wore the same suite at her brother's wedding in 2001. Stay tuned later today for more flashback jewels!